Toon's Tunes : Aftershock reviews: let's begin. Avatar rule!!! Yes, they do. Aftershock reviews: let's begin. Avatar rule!!! Yes, they do. 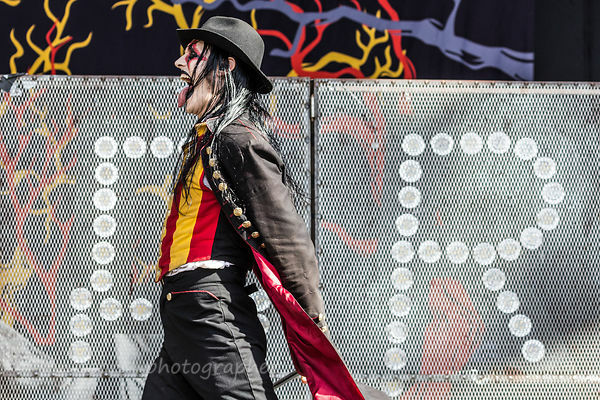 It's 2 p.m. on Saturday at Aftershock in Sacramento's Discovery Park; the sun has come out, the crowd has warmed up, and Avatar's freakshow is in town. 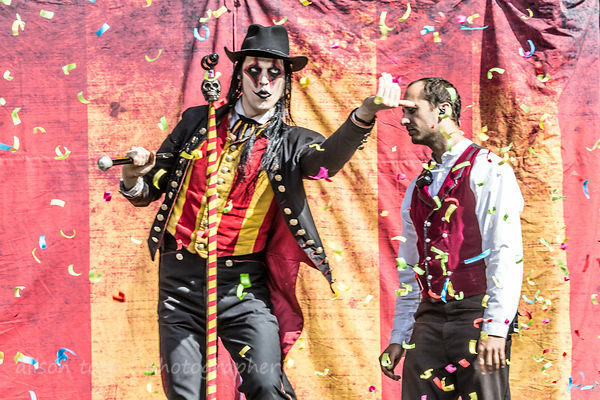 Circus curtains and circus colours, confetti, a discreet skull-on-a-walking-stick; scary-circus-clown-makeup, old-soldier's uniforms, these guys bring real-heavy, Swedish metal to town, but with the showmanship of a travelling band of genius gypsies, charming their way into your ears and hearts and music collections. Artistic yet grounded; intense yet entertaining, Avatar bring meaning to the word, "performance". Top-notch, and I hope, or rather I expect, to see them headlining tours and festivals in the very near future. In a Saturday that was heavily-weighted towards thrash metal, Avatar were my shining light, and by far my favourite band-never-seen-before of the entire Aftershock weekend. I'd hoped to see them earlier in the year at Houston Open Air, but it wasn't possible. And while there were people in the audience who were already familiar with Avatar, in part through regular airplay on Sirius XM Octane, there were many who discovered the band for the first time, and who are now primed for a return visit to Northern California. 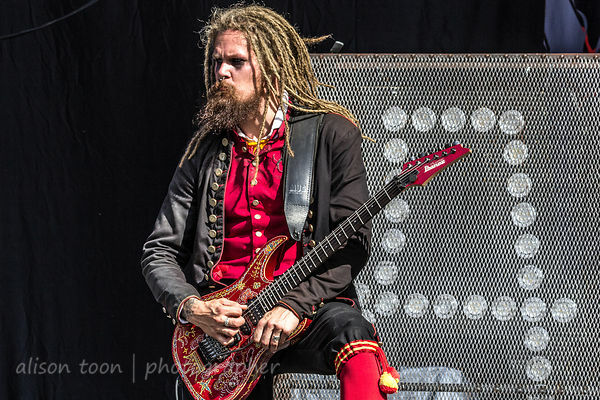 Frontman Johannes Eckerström leads you into the music, ringmaster-entrancing, and he has you buying snake oil by the gallon before you have the time to raise those metal horns in the air. The music is excellent: the show, divine. This is the kind of performance an audience craves. 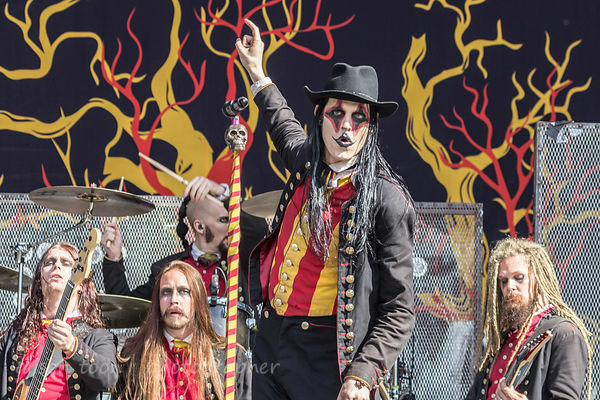 Every little detail is taken care of; the makeup, the costumes, the beautifully-decorated Ibanez and Spector guitars and bass, the buttons, the lines-of-sight, the curtains and confetti, the pom-poms and red stockings, the hat, the dreadlocks, the blue eyes... and above all, the music. The was the show. This was my Aftershock. There will be more. For many more photos, click here to go to the Avatar photo gallery. 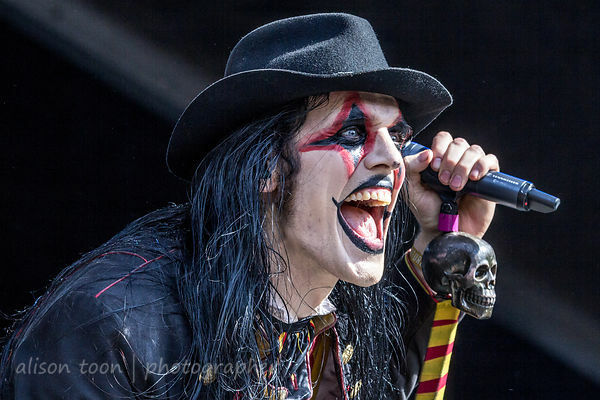 Check out Avatar's latest album, Feathers and Flesh, which features the song that's seeing a lot of radio play recently, The Eagle Has Landed. (The vinyl version comes in beautiful orange and yellow pressings!) And here's the latest video: Night Never Ending.